We’re proud to announce the release of VIA 8.0 Practice Management Software. Our latest product upgrade contains many new features and enhancements to help increase your productivity. To learn more please visit www.viainfosys.com/updates/ or contact VIA Technical Support at 866-269-8284 option 1. New for the VIA 8.0 release is the Desktop Dashboard, which provides instant access to your current records along with daily summaries of all hospital activity. View dashboard summaries by provider, business center, or the entire facility to monitor the day’s productivity on work that is pending and completed. See information such as how many invoices were billed, appointments seen, and labs ordered. 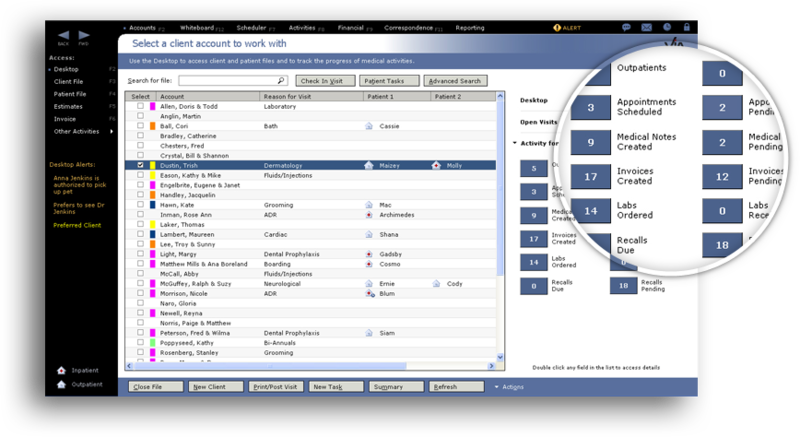 To improve your speed, you no longer have to go to the Patient File to complete records but instead can click on any dashboard view to see the details and carry out related actions. Use the Lab dashboard to see all lab orders and pop up the detailed lab results to review and sign off the record, or complete your SOAP notes, view radiology images, print prescriptions, check in appointments, and update patient recalls all without leaving the Desktop.